Sign up to support the heritage plan concept! Please consider listing your neighborhood and street of residence. Doing so allows us to provide you with targeted information to take the most effective actions (e.g., letters of support to your alders or neighborhood association, or notifications of potential Lake Wingra shoreline development within your district). We will not share your information with any other party. How can we use your support? FoLW can put my name on a list of supporters to show my local officials. FoLW can send me periodic emails about actions I can take to show my support. I’d like to actively help with this grassroots campaign. Unlike the other lakes within or near the City of Madison, Lake Wingra has very limited development along its shores. 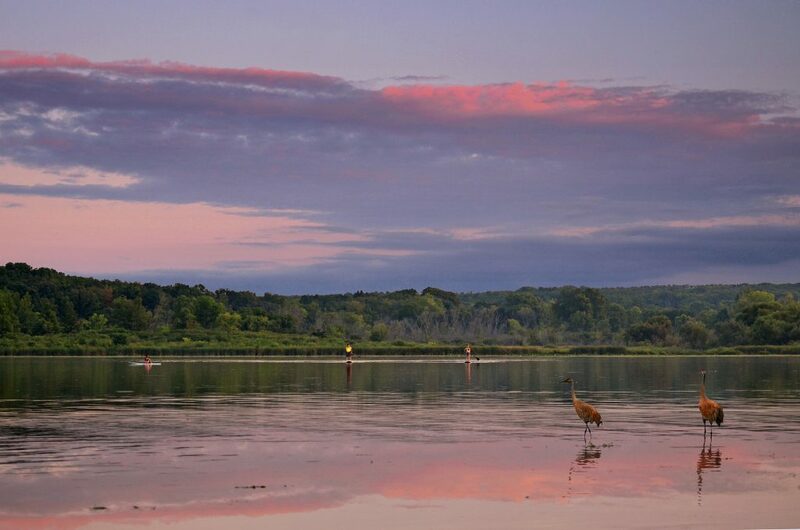 The resulting scenic views and character of the Wingra watershed allow community members quick and easy access to a rare vista for a city of Madison’s size. Lake Wingra can feel like a Wisconsin summer camp, offering an array of recreational activities—swimming, boating, fishing, hiking, etc. —all with an unpolluted view of natural shoreline. Friends of Lake Wingra is seeking to protect this unique landscape in its current ‘natural’ state. Our goal is to protect and enhance this landmark for years to come. Inspired by Wisconsin Scenic Rivers legislation, we would like to see the City of Madison legally preserve the natural viewshed for future generations (through the Comprehensive Plan and Planning & Zoning Departments). We hope to restrict development and implement design guidelines along the shoreline. It is too easy to take for granted that much of the vista across the lake appears free of man-made structures that might disrupt the view and decrease the value of our resources. Without protections now, there is no guarantee future generations will have the same experience. Stay tuned for updates on how you can help preserve and improve the scenic natural beauty of Lake Wingra for future generations! August 3, 2017: The City of Madison Planning Commission held an August 3 work session to review draft strategies for the City’s new comprehensive plan. We submitted comments supporting some of the draft strategies that we feel support our Heritage Plan Concept.